Sunday, the mayor's office jubilantly announced that normal trash collection would resume Monday. I am curious to know how that worked out for everyone who had trash collection yesterday. Because in my alley, there are 18" of glorious, untracked snow. At least there were as of yesterday morning. As of this morning, it was more like 12" of glorious untracked snow, with 3" of ice melt that had refrozen into a spectacular impenetrable shell. 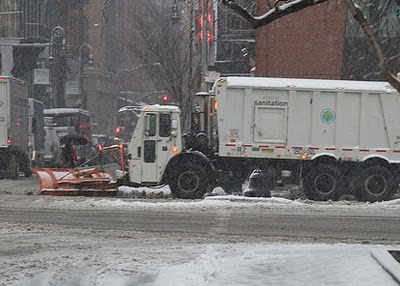 (Washington, D.C.) – The District Department of Transportation (DDOT) and Department of Public Works (DPW) want to remind residents that as a policy the District does not plow alleys. I am having a hard time getting my head around these two seemingly diametrically opposed notions. DC does not plow alleys. Normal trash collection will resume Monday. These really exist. Not in DC, though. In my mind, I am trying to put a square peg into a round hole. I have even tried turning the square peg sideways. I am now thinking about going to the basement with the square peg, and chopping the corners off it. I am sure I can make it fit in the round hole, but it will not be pretty, and there will be a lot of damage to the square peg. And using the miter saw on small blocks of wood is very dangerous and sometimes results in the blocks of wood flying across the room. I will wear safety glasses. Umm... anyway... where was I? Oh yes. Garbage trucks in unplowed alleys. Alleys which, actually, DC has not only not yet plowed, but has no intention of plowing. Yesterday I complained about the fact that many side streets near where I live had apparently not yet been plowed. DC has an online snow-plow tracking tool that is actually very cool. It will show you where snow plows went interactively using a time-lapse map. It also confirms that a lot of Petworth was not plowed at all. This note was interesting for several reasons. Why are residents higher than in years past? Is marijuana use on the rise in DC? Or is it the quality of weed that's improving? So, you are basically admitting that more than two days after the snow stopped, you still haven't cleared all the roads. DC has 1,100 miles of roadways. That's a lot, but actually less than I would have guessed. Very useful information. DDOT's web site says that "The District has 330 pieces of equipment and 750 personnel available for any given storm. This includes additional contract plows, if necessary, for major weather events." So we have 330 snow plows and 1100 miles of roadway. That means that if we mobilized all the snow plows, and each of them plowed one mile of road every 30 minutes (which seems like a pretty conservative estimate), then every single mile of road in DC could be covered in about, oh, two hours. Let's account for mismanagement and bad routing and double that, to four hours. Let's account for half of the snowplows being broken down and double that, to eight hours. I am really trying hard to think of other reasons to add more time to this estimate, but I can't come up with any. DC should be able to go over every inch of road in this city in eight hours maximum. It is now approximately 50 hours since the last snowflake has fallen. Can you tell me again why you are too busy to plow the alleys? Actually, never mind the alleys. Why I am still driving on 4" of hard packed snow and ice until I get to 16th Street? I think the garbage trucks can make it through the unplowed snow in the alleys, so no contradiction there. The city does a cost-benefit analysis of whether stocking more snow moving equipment is worth it for the large blizzard that occurs every 5-10 years. Their conclusion is that it's not. So while it may seem inefficient to have an extra few days without full use of the roads every decade, paying less maintenance the other few thousand days makes up for those few days. I agree with that, and don't expect DC should be able to handle this the way (e.g.) Boston might. In those places, most streets are clear hours after the snowfall. The plows are out constantly until everything is done. I grew up in such a place. But I think it's not unreasonable that every street should have had a plow go by two days after the snow's stopped falling. I don't think this has anything to do with lack of equipment. There's a lot of conflicting information. On Monday, DDOT said that "anyone who's street has not been plowed should call 311." Today, DDOT says "we are too busy plowing streets to do alleys (and we don't do them anyway)." The math doesn't add up - there has been plenty of time to hit all the side streets at least once. Yet the snowplow map (as well as my eyes) clearly shows that many have not yet been addressed. I couldn't say why this is, but the most likely answer is just bad organization in where the plows are deployed. The map is cool. But it's obviously not helping them find places that need plowing, if they want residents to call 311. We shouldn't be expected to tell them where they need to plow. Oh as for the garbage trucks and alleys... well, I will find out when I get home today if they've been by, but I'll be pretty impressed if they could get through my alley. I drove through it with my jacked up 4WD pickup truck yesterday. I was the first person who dared to do that and it very nearly did not work out for me. My alley has four turns and is narrow, the garbage trucks have a hard time under normal circumstances. Seemed like a better idea than shoveling a path to the alley through 50 feet of backyard... well, we all do stupid things sometimes.